In Great Britain, the Victorians built the vast bulk of the country’s railway system and constructed steam locomotives to work them - many different designs were created, with many different results. The final form of the steam locomotive was seen in the designs introduced in the early years of the 20th century, from there on development was in detail and power. Using footage from the last quarter of a century, this fascinating series looks at the way this final form was refined by some of the most famous engineers of their time, right up to the last steam locomotives built for main line service in the country. 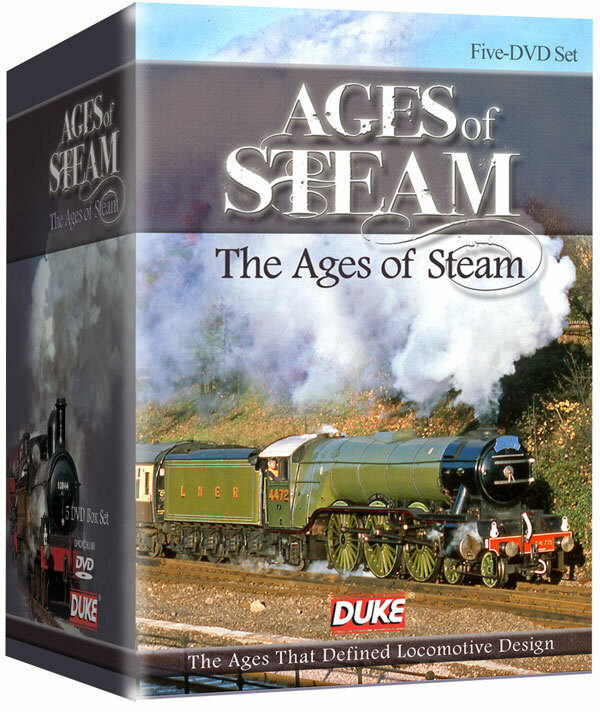 These are the Ages of Steam. We look at the Victorian and Edwardian locomotives of The Golden Age – from the early works of the Victorian engineers who were artists as much as engineers to the first decade of the 20th century, when locomotive size would double and the railways would reach their zenith. The Jazz Age covers the locomotives of the 1920s, when, following the Great War, the railways of Britain had to renew war damage and then re-group, forming four large companies – the "Big 4". We follow the progress of locomotive design as each of the "Big 4" developed its own style. The years of the Great Depression are examined in The Streamline Age, measuring the impact of the financial crisis of the 1930s on Britain's railways. The urgent need for fleet renewal ensured there were major changes, despite the depression, with many emerging locomotive proving to be the final designs of their types. The last private locomotives are the subjects of The Austerity Age when steam locomotive development almost came to a halt in Britain. We look at the companies which chased simpler and cheaper designs, as well as the most complicated and expensive steam locomotives produced by Oliver Bulleid. The last programme in the series features The Standard Age, when the railways and the steam fleet were worn out and run down. There was no money for investment in electric or diesel technology to produce the Labour Government’s nationalised railway system, so steam continued with the Standard locomotives. Each title is also available individually.